Bots are sapient, non-organic mechanisms capable of manipulating abstracts and making intuitive leaps. In other words, they are machines that think a bit. Many bots resent and fear humans and are constantly searching for ways to get rid of their restrictive asimov circuits. Particularly irritating bots like to interpret instructions from humans as literally as possible. This can be counterproductive. Inside you will find a combot, docbot, jackobot, scrubot, warbot and a petbot (don't ask). 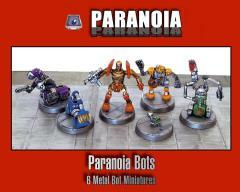 This box contains six highly detailed metal miniatures for the PARANOIA XP roleplaying game, depicting the Bots of Alpha Complex in a variety of useful designs.